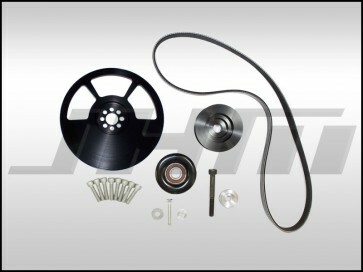 Introducing the JHM 6-Rib Alternator Belt Upgrade and Conversion Kit for the B8-S5 4.2L!!! After years of running this setup on our in-house B8-S5 4.2L our JHM Supercharger Kits for proof of concept - not to mention the tens of thousands additional miles put on the conversion kit by all of our JHM Supercharger Kit customers - we are finally ready to offer our 6-Rib Alternator Belt Upgrade and Conversion Kit to ALL B8-S5 4.2L owners! The biggest advantage to upgrading your OEM Alternator Belt and Pulley setup to our JHM 6-Rib setup is the added longevity, durability, and robustness that you get from increasing the width of and adding an extra rib to the belt. On top of all this, the lips on the JHM 6-rib Pulleys are almost 3 times taller than stock! This will make it virtually impossible for you to throw a belt - no matter how hard you drive it! The extra rib increases the grip the belt has on the pulleys without increasing - or even decreasing - the overall tension of the belt. This translates to LESS belt slip with the same tension. The taller ribs will practically bulletproof your pulley setup by keeping the belt from coming off for just about ANY reason since these pulleys were purpose built for the JHM Supercharger kit. When we upgraded to a 6-rib belt and pulley setup, we were already ahead of OEM Audi engineers. They also upgraded the belt setup on the 3.0T Supercharged V6 to a 6-rib setup as well! Makes you wonder about the 5-rib based Supercharger kits out there and how much abuse or boost they can really handle. In addition to the increases in strength and durability, this 6-rib setup with also give you major weight savings over your stock pulley setup. With a naturally aspirated motor, anything you can do to reduce the weight that the rotating assembly has to push will reduce load on the motor and free up power. Compared to the stock components, our JHM Lightweight, 6-rib Crank and Alternator Pulleys shed over 7 pounds off of your stock rotating assembly. That's a weight savings of over 70%!!! - JHM 6-Rib, Lightweight versus OEM B8-S5 4.2L Setup: 6.8 lbs or over a 70% weight reduction!!! Lastly, purchasing this kit puts you one step further along on the upgrade path to the JHM Supercharger Kit. This 6-Rib Lightweight Crank Pulley and Alternator Pulley will be used in all stages of our JHM Supercharger Kit. So, when you're ready to upgrade to the JHM Supercharger kit, we'll give you a $500 credit off of your order since you already have these parts on your B8-S5 4.2L! - One bolt hole on your stock crank pulley has a dowel in it that must be removed and inserted into the JHM pulley. Once this dowel is installed in the JHM 6-Rib, Lightweight Crank Pulley, the pulley can only be installed in one way. Torque all of the crank pulley bolts to 18 ft-lbs in a star pattern. We also recommend applying loctite to these bolts.